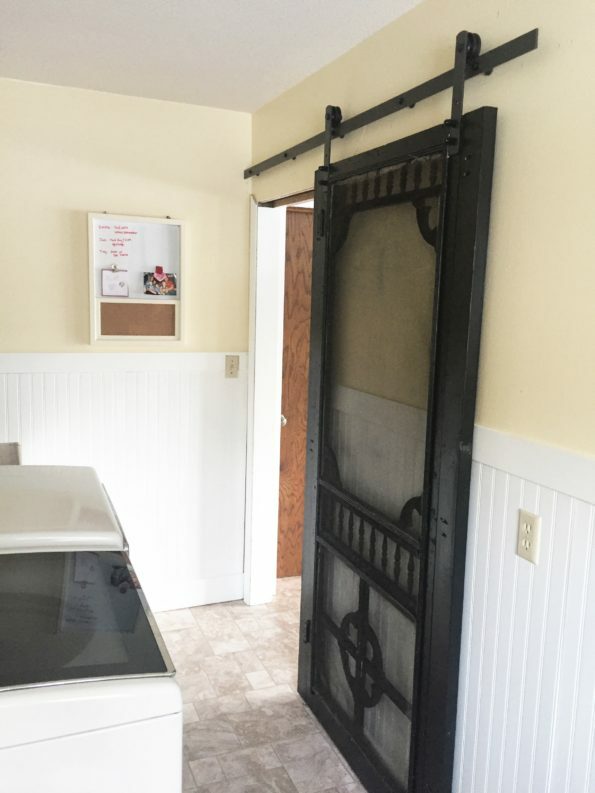 Nothing says farmhouse more than an old screen door. So you can imagine my excitment when I discovered my grandma’s old enclosed porch had not one but TWO old screendoors. One was not in the best of shape but my dad suggested I might as well take both – and that’s all the convincing I needed. So I did something I don’t do very often – and no it wasn’t eat my vegetables (if you know me you definitely know that doesn’t happen very often). I decided to repurpose them simply for the sake of decor. Normally when I build something or repurpose a piece of furniture I’m always thinking of a way to make it add function to our daily lives. But these babies were going be used to simply add some pretty and make me happy. 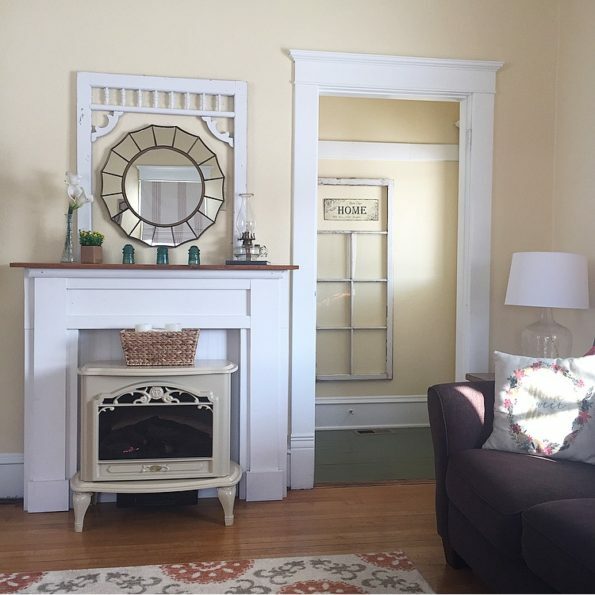 Luckily my style is rustic so with a coat of white paint and some repositioning of the remaining corbels, I’ve been able to use it to give some depth and dimension to my fireplace. 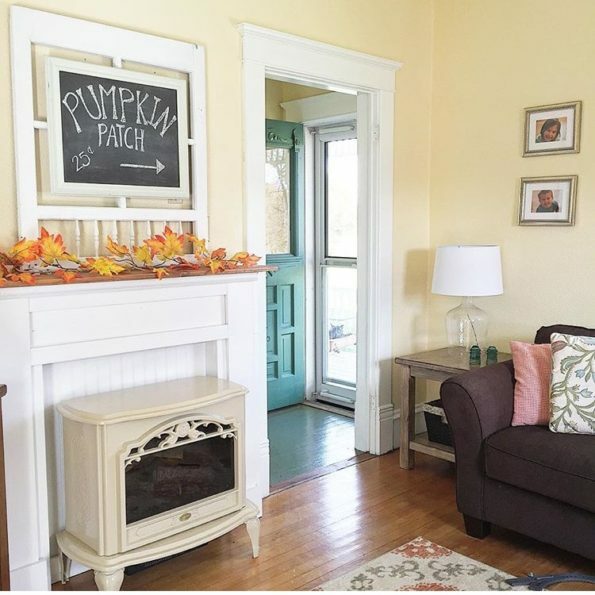 In the fall and winter I placed it upside down behind the mantle and hung a chalkboard sign. Currently I have it right side up to show off the corbels. 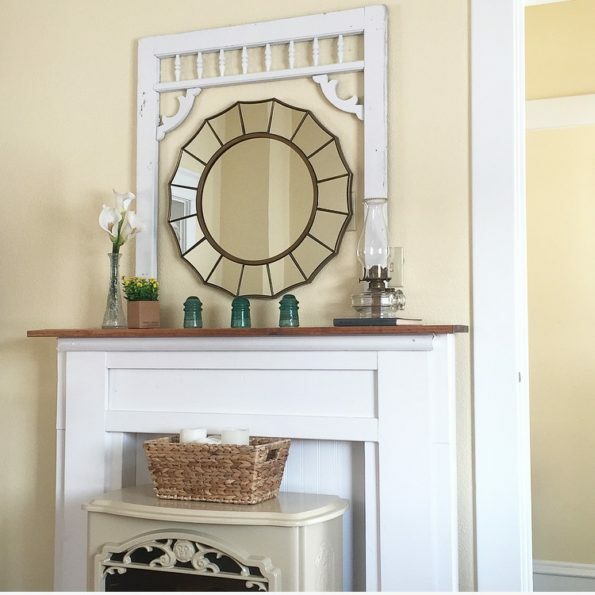 It frames my mirror beautifully! 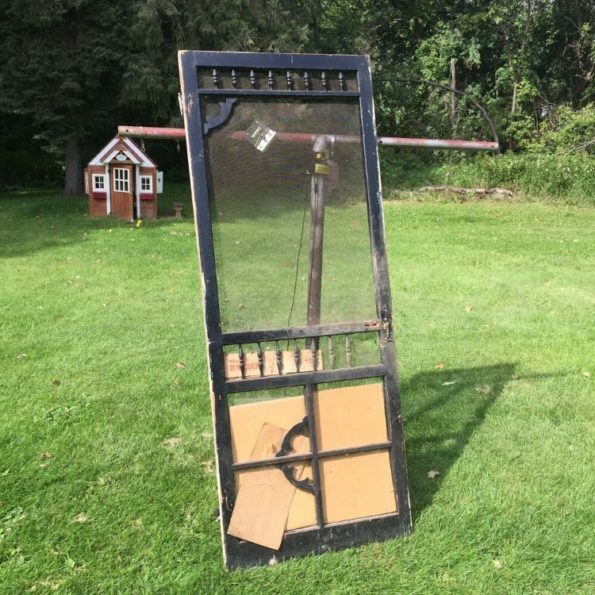 The second door was in a lot better shape. 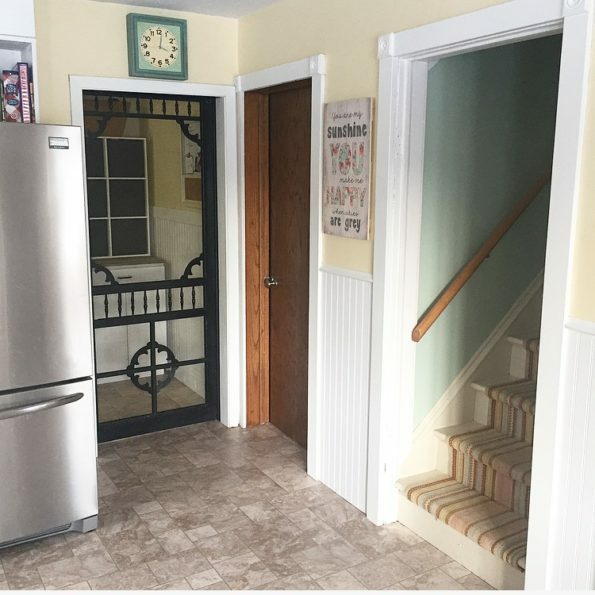 I had a vision of hanging it barn door style in the doorway that separates my kitchen and my laundry room. Sounds easy enough right?! 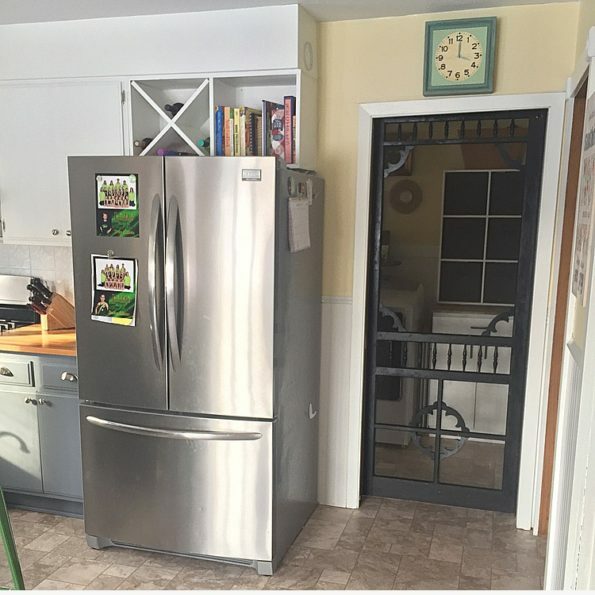 Well nothing is every easy when you are modifying anything existing – especially on an old house. You see that doorway already has a pocket door which I planned to keep intact in case I wanted to shut it for noise from the dryer at night. The problem a pocket doorway brings to the situation is you don’t have normally spaced studs in that area and the barn door hardware I had purchased came with pre drilled holes for standard spaced studs. No problem though right because I have an amazing husband who volunteered to bring my vision to life by drilling new holes in the hardware. Too bad that hardware metal was forged by super man himself! It took a lot of muscles, probably a few choice words and a better part of an afternoon for my wonderful, amazing, awesome, talented husband (did I get that all honey 😉😘. By the way have I said thank you lately) to get all the new holes drilled out for me. After we got it hung I still wasn’t done with this “simple” project. The screen had a bunch of paint drops all over it from the last time it was painted. It took me a couple hours, some goo gone, cue tips and toothpicks to get most of it cleaned up. Last I added some width to it with a couple of 2×4’s on either side so it would overlap the opening. Initially I was going to paint it white or maybe green but after I saw it hanging I kept it’s original black color. In the summer the laundry room floods with bright afternoon sunlight. I think it will highlight that old screen door gorgeously. It was a lot more work than I has anticipated and it adds almost no additional function like I said, but it definitely makes me and my wool socks nostalgically happy. It looks great and Grandma Bell would be proud! It does look really nice!!! Another get job! !